How do I play Texas Hold'em? Goal: Use the cards you're dealt and the community cards to create the best hand possible. Texas Hold ‘Em is a type of 7-card poker. Please note: The game may look different depending on the device you're using. Blinds are forced virtual bets, placed to get virtual betting started. They're posted by the players to the left of the dealer. 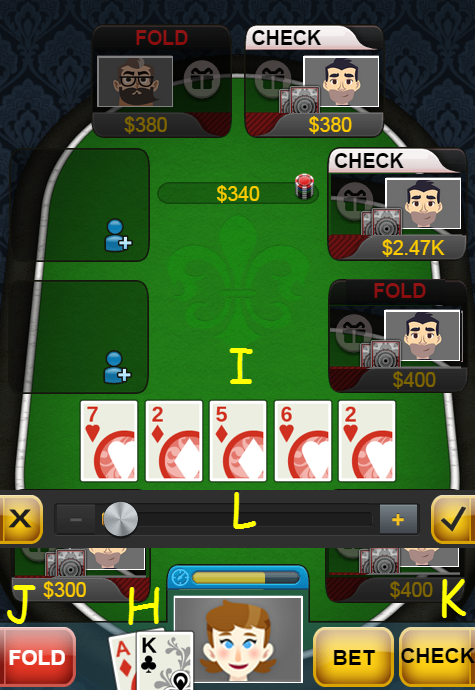 The smaller blind is placed by the player to the dealer's immediate left. The second player on the left posts the larger blind. 2. Each player is dealt two "Hole Cards" (H). 3. The first round of virtual betting begins. Fold - If you do not want to stay in the hand, select ‘Fold’ (J). You will lose any money you have already put in the pot. Check - If no one has placed a virtual bet, you can select ‘Check.’ (K) Checking costs you nothing. Call - If someone has virtually bet, then you are given the option to ‘Call’ to match the virtual bet. Bet / Raise - If you want to virtually bet more, you can ‘Bet’ or ‘Raise’ (L). 4. Three community cards dealt. 5. The second round of virtual betting begins. 6. A fourth community card is dealt. 7. The third round of virtual betting begins. 8. The fifth community card is dealt. 9. The final round of virtual betting begins. 10. All hole cards are flipped to reveal the winner. For more information, please check out our Texas Hold'em Guide.